As part of Bolton’s World War 1 commemorations Bolton History Centre is endeavouring to produce a database of Bolton casualties. The database will comprise information gleaned from Bolton’s Roll of Honour, the Commonwealth War Graves Committee index, local newspapers and war memorials. The database will include the names from the cenotaphs and memorials in parks, schools, hospitals, churches and other places in the Bolton Metropolitan area where war memorials are still in existence. Additional information such as rank, battalion, date and place of birth, residence, place of death will also be recorded. During the War, some of the local newspapers ran a special page each issue detailing the news from the front, listing the awards and medals won, those missing in action and those who were killed. A short biography of each serviceman was published which included such information as when and where they enrolled in the services, their school or former place of employment, and whether they were single or married. In most cases a small photograph was also included in the newspaper, which is exciting for the researcher to find as this may be the only image of that serviceman in existence. Local knowledge of the area will be used to find undocumented memorials by engaging with local history groups and individuals, who will help us by taking images of the memorials or transcribing the names listed. Once the information has been gathered, the database will be accessible in the Bolton History Centre. 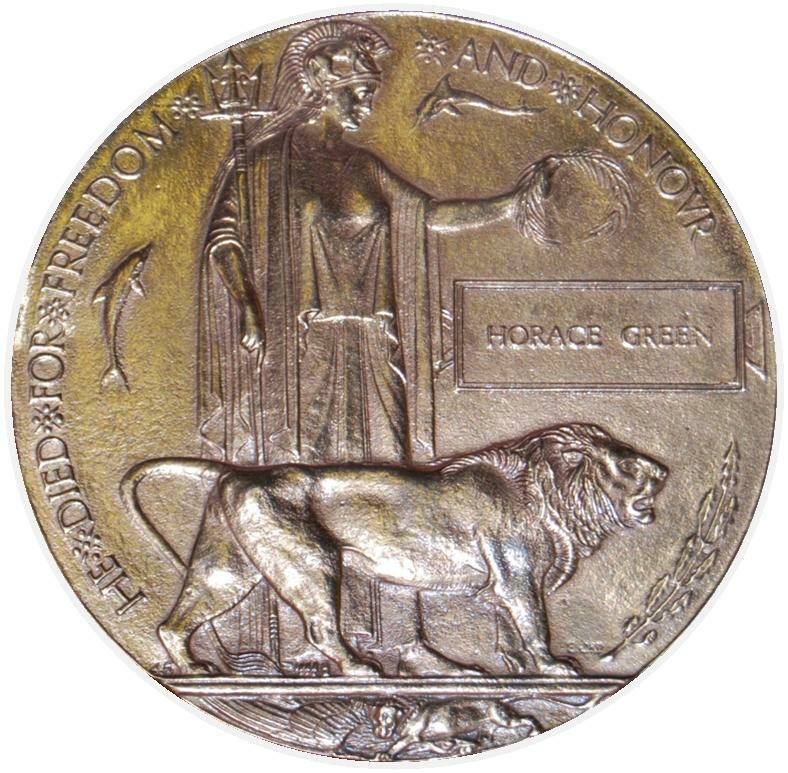 Image: First World War Memorial Plaque more usually known as the “Dead Man’s Penny” belonging to Corporal Horace Green, of the Royal Field Artillery. Son of John and Elizabeth Green, of Aspull, Wigan; husband of Ann Green, of 247, Church St., Westhoughton who died on 5 Dec 1917 and is buried in Orchard Dump Cemetery, Arleux-En-Gohelle, France. The plaque is on display at Westhoughton Library, Library St, Bolton, BL5 3AT.